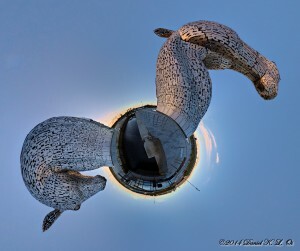 The Kelpies is a sculpture by Andy Scott and is situated in the Helix Project in Falkirk. I was fortunate to catch them on a reasonably cloudless day, though some cloud cover on the horizon spoiled a promising sunset. The site is a bit awkwardly located, there is a motorway on one side and powerlines on the other so finding a direction to avoid these background distractions is challenging. For a spherical panorama, the only thing you can do is pick a position that hides any unsightly views and accentuates elements of interest. Here, I chose a spot in between the two massive horse heads next to the canal lock. There were some rays of the setting sun to outline one head and bath the other in a warm glow.